In order to have quick and easy meals at hand during the busy week, I often do a little extra prep on the weekends. I've mentioned before that I love to cook a big pot of beans or lentils, and then use them for wraps, tacos, or sides. Sometimes I'll make a couple of types of pasta, cool them down, and stick them into zippered baggies for tossing into quickly sauteed veggies and sauces. Big batches of grains like rice, farro, freekeh, or quinoa are another good example of something that can be made in a large batch on Sunday, then reheated quickly on a weekday. Now, often our protein is made day-of, to keep it from drying out or getting overcooked. But there are a few ways and preparations that lend themselves to advanced cooking. Large roasts and shoulders that can be shredded and stretched throughout the week are what come to mind first, along with chicken things. Just think about the fattier cuts, since the fat is what will keep them from drying out. That said, I also like to make a batch of chicken breasts in advance. So basically, the exact opposite of those fatty cuts. I think the secret is gently poaching them in a highly seasoned liquid until they are just cooked through. I actually like storing them in the fridge IN some of their cooking liquid, as well, to help them stay moist. Then, over the next few days, you can cut the breasts into chunks, shred them, or slice them thinly for use in chicken salad (the mayo kind), cold chicken salad (the "fan it over the top of the greens and such kind"), stir it into a salsa for a taco filling, roll it up into tortillas and fry them for flautas, or use them in a sandwich or wrap. Take for example this wrap. If you have that poached chicken breast in the fridge, the only time it takes is mixing up the tangy mustard sauce and folding in the chicken. 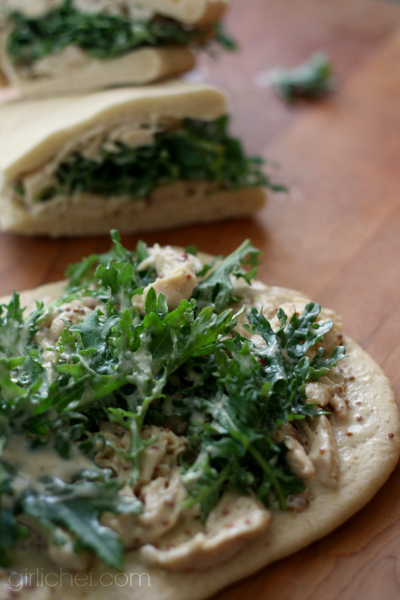 Spread it on some flatbread, top it with some greens, and you've got yourself a meal. A tasty, tasty meal. 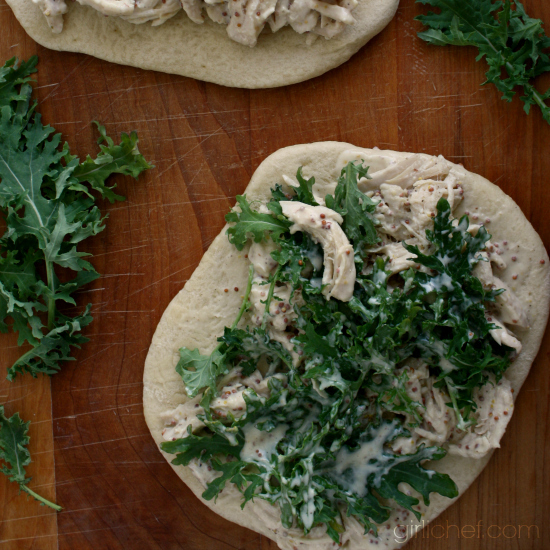 Chicken in a creamy, tangy sauce rolled into flatbread with baby greens. Put the goat cheese, sour cream, mustard, and honey in a large bowl and beat together by hand until well-combined. Season with black pepper. Pour about 2/3 of the mixture over the shredded chicken breast and toss to combine. If you want it saucier, add the rest, or serve it on the side for dipping. 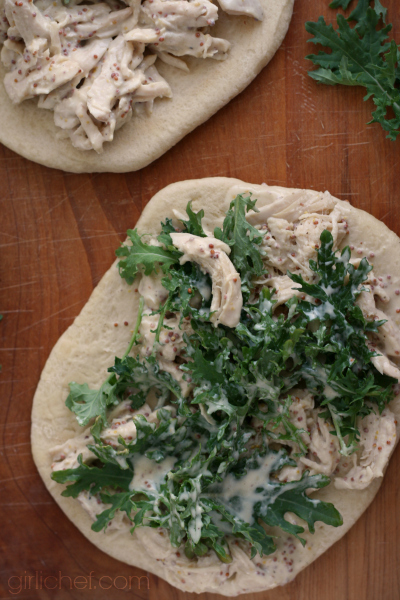 Lay the flatbreads out on your work surface. Divide the saucy chicken evenly over them, leaving a 1/2-inch border all around. Divide the greens over them. Fold in half if using small flatbread, or roll it jelly roll-style if using large (and then use a serrated knife to cut into pieces).